Kendon Kayser is not the only Louisiana wrestler who fared very well in his new home state this season. Sam Johnson, who placed third in the 2015 Division I state championships at 145 lbs., placed fourth at 152 lbs. in the South Carolina 4A State Championships held on February 26th and 27th at Westside High School in Anderson, South Carolina. Wrestling for Zachary High School in his junior year, Johnson won the Central Wildcat Open and the Griffin Open, placed second (due to a disqualification when he had a large lead) in the Warrior Open, the Ken Cole and the Greater Baton Rouge Championships, and placed fourth in the Louisiana Classic. During his junior year at Zachary Johnson defeated 2015's Division II state champion Zach Funderburk of Parkway, Division I runner-up Danny Evans of Brother Martin, Division III state champion Gavin Cortez of Basile and, in his third try, the 145 lbs. second-seed Brandon Cowell of Dutchtown. Just as impressive, though, is the list of wrestlers he defeated who were prominent in the 2015-16 season. They include Division I runner-up Clint Brownell of St. Amant and 3rd-place winner Griffin Mason of Jesuit in the 152 lbs. weight class. Division I runners-up Sage Nugent of St. Amant and Jacob Fereday of Catholic are on that list, as is Division III champion Owen Mabile of Brusly. Wrestling for Dorman High School in Roebuck, South Carolina, Johnson was out with a shoulder injury for half of the season yet still posted a 17-3 record with 10 pins, one technical fall and three major decisions. He won his school's 4A regional tournament as well as the South Carolina Upper State Championships to qualify for the state championships. In the eight-man bracket Johnson lost his first match 3-2 to the second-ranked wrestler in the state (who ended up placing second to the top-ranked South Carolina 152 lbs. wrestler). He pinned his first consolation bracket opponent and won a 6-4 decision in the consolation semifinals. In the match for 3rd-4th place he lost 5-3, in part to some very questionable calls (confirmed by a friend of the LWN's editor). Dorman's Sam Johnson (with blue-striped singlet) at the South Carolina State Wrestling Championships. LEFT: South Carolina also has a 4A State Duals Championship, pitting the best of the Upper State in one side of the bracket and the best of the Lower State in the other. Dorman entered with a 20-2 record and a second place regional finish. 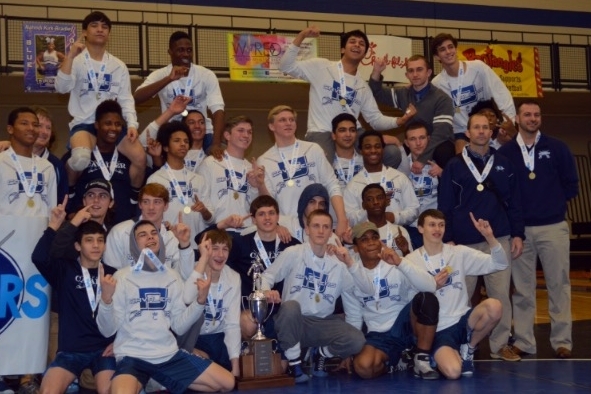 In their second match of the Duals Championship (held over seven days) they defeated two-time defending champion Rock Hill 34-32. In the semifinals they defeated the team who won their regional event, Boiling Springs, 28-24. In the finals against the Lower State winner, Ashley Ridge, Johnson started the match with a fall to lead Dorman to a 34-25 4A State Duals Championship. RIGHT: Johnson with his Upper State Championships trophy.